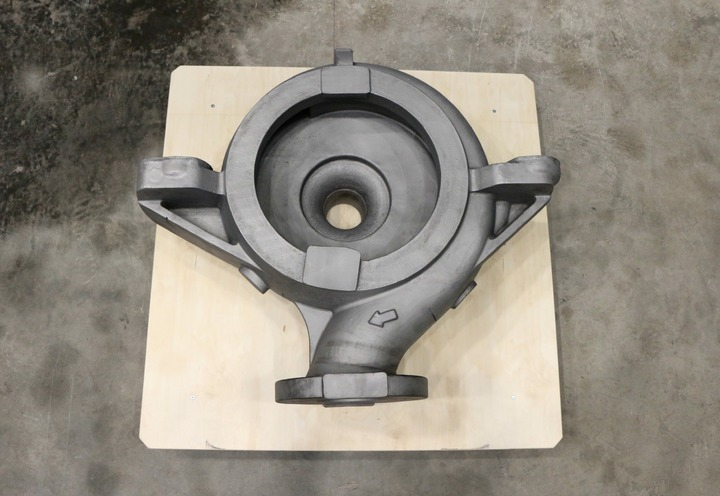 Europe’s largest ceramic shell titanium casting has been unveiled in South Yorkshire by the Castings Group of the Advanced Manufacturing Research Centre. The large-scale, near net shape casting is an industrial centrifugal pump housing, used for highly corrosive applications in the chemical and petrochemical sectors. It was a single pour from a 680kg melt with the finished part weighing 200kg. AMRC Castings said it is now working towards pouring over 1000kg of titanium for a 500kg part-weight centrispun casting by May 2018. A molten mass in excess of 1000kg is required to make a 500kg titanium casting and a small number of furnaces exist globally that can cast near net shape components of this size. The facility’s Retech consumable electrode castings furnace has three interchangeable crucibles capable of melting titanium for castings weighing up to 500kg and 2000mm (2m) in diameter by 2500mm (2.5m) in length. AMRC Castings’ new furnace became operational in March 2017 and is part of an investment and R&D programme expected to give UK companies a springboard into global markets for large scale titanium aerospace engine and structural components.